Suzanne Beecher might be familiar to many readers from her daily columns through libraries, DearReader.com. Or you might know her website, MuffinsandMayhem.com. But, even if you've never "met" the author and book pusher who also shares recipes, you might want to try her memoir, Muffins & Mayhem: Recipes for a Happy (if Disorderly) Life. Suzanne Beecher did not have an easy childhood. An only child, she came from a household where both parents worked, her father drank, and her mother had high expectations for her daughter that included a great deal of work and chores. Suzanne married at 16, when she was pregnant, and her parents never forgave her. After giving birth, she took pills to lose weight, and became addicted. She was a single mother at nineteen, a young woman who made bad choices, and remarried at twenty, to a man who was gay. But, one good thing came from her addiction, the chance to enroll in school, qualifying for free tuition. It took time, but Suzanne Beecher found her way to a successful marriage that has lasted thirty-two years, and, despite her fears and feelings of inadequacy, a successful career as her own boss in various businesses and nonprofit enterprises. There have been setbacks along the way, including health issues, but Beecher actually found a way to look beyond all of that. And, it's those recipes and stories of life that she delights in sharing. The book tells of her problems in life, and her failings, but it also includes her favorite stories and recipes, "The stories that keep me grounded in this unpredictable world." She says her recipe box is filled with the necessities of life, "Stories to help keep me grounded and recipes for good stuff to eat." So, look beyond the hard times, although they helped to make her strong. Suzanne had a grandmother she adored, and a husband she loves. Her book not only includes recipes, and stories of her businesses, but also wonderful chapters of love and warmth. The one about her husband, Bob, is special, called, "He Loves Me, He Loves Me a Lot." And, since Beecher found resolution to her problems with her mother, the chapter to cry over is, "I Miss My Mother." But, there's humor as well. Suzanne's chapter, "Please Give This Woman a Job," talks about her fears she'll be bored in heaven, since one perk is "There's no need to work." Her description of heaven? "The streets are paved with gold, you get an automatic face-lift and tummy tuck when you pass through the Pearly Gates, you don't have to share a room, the water's nice and hot the minute you turn on the tap, and you get to see all of your friends and loved ones who have passed on before you. My Grandma Hale and I have made a date for brunch the morning after I check in." Suzanne Beecher's memoir is the story of a woman who has faced a challenging life, and found ways to surmount the challenges. Muffins & Mayhem: Recipes for a Happy (if Disorderly) Life can be read for inspiration, the story of a life, or recipes. It can also be read as a message from a friend who cares enough to share her life, her fears, and her successes. Beecher is a friend who ends all of her DearReader.com book columns with the same message, one she shares in the book. "Thanks for reading with me. It's so good to read with friends." 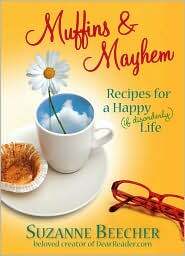 Muffins & Mayhem: Recipes for a Happy (if Disorderly) Life by Suzanne Beecher. Simon & Schuster, ©2010. ISBN 9781439112878 (hardcover), 233p. I love memoirs so I'll have to get to this one soon. Suzanne sounds like she's had quite a life. I love anything non fiction but memoir are my favorite. Thanks for sharing this. Suzanne has had quite a life. It's amazing to see what she made of herself after what she went through. You're welcome, Lauren. I hope you're able to pick up this book.